Fresh Vermont cream and sweet butter, amaretto, almond cream, hazelnut, white raspberry and dark raspberry ganaches. Our enticing chocolate collection this month comes from Green Mountain Chocolates, an internationally renowned company tucked into the pristine hills of the Vermont countryside. Using all natural ingredients and an abundance of skill, these famed chocolatiers create amazing chocolates, thanks to the remarkably talented Albert Kumin. Kumin, a Swiss-trained chocolatier and patissier, founded Green Mountain Chocolates in 1988. Just two years later he was recognized for superlative expertise in the art of chocolate making and inducted into the Chocolatier Hall of Fame. We are thrilled to bring you this culinary genius's signature line of truffles—chocolate treats that are flawlessly balanced between bitter and sweet—with creamy, powerfully rich, double-filling centers. Each of these charming chocolates consists of a wonderful combination of chocolate, fresh Vermont cream, sweet butter, and a multitude of natural flavorings. Green Mountain Chocolate's premium ingredients--combined with careful packaging--assure extended freshness and a three-month shelf life, a fairly long time for fresh, quality handmade chocolates to keep. All quality chocolates have a limited lifespan, a true testament to the saying, "All good things must come to an end." The hand-rolled truffles we're so proud to bring you this month come in five unique flavors, each with a sort of "split personality." Each offers two exceptionally distinct tastes in the ganache surrounded by deliciously pure chocolate. As most of you probably know, ganache is a thick, extremely rich chocolate cream filling. It’s handmade at Green Mountain by pouring hot cream over velvety smooth chocolate chunks and then whipping the mixture until the chocolate melts. Ganache is used by Green Mountain chocolatiers for half of the filling and also as the base of the truffle. This is a sumptuous mixture of equal parts chocolate and cream. It is one of those rare yet ultimately fabulous combinations where one main ingredient enhances the other. Natural flavoring and fillings are then added to the other half of the truffle, and the two halves are pressed together, giving each a unique combination of distinct flavors. These chocolate gems are then finished with their own signature toppings and coverings, adding the ultimate final touch. Amaretto—a half almond cream and half amaretto truffle, rolled in roasted almonds; an incredible combination to relish layer by sumptuous layer. Hazelnut—a half hazel cream and half hazelnut truffle, rolled in hand-roasted hazelnuts for an attractive and delicious covering. Enjoy these with your favorite coffee – hazelnut perhaps? Caramel—caramel ganache and sweet liquid caramel come together to create this stunning truffle draped in silky smooth milk chocolate. Double Chocolate—masterfully created with Green Mountain's milk chocolate and dark chocolate ganache and sprinkled with delicate and delicious chocolate shavings. Raspberry—a truffle made with half white raspberry ganache and half dark raspberry ganache and rolled in deep dark chocolate and sugar—a remarkable treat indeed! A reminder for our Jewish friends this holiday season—all of Green Mountain Chocolate's creations are kosher. Initially Albert Kumin developed his craft under the guidance of the Swiss masters. At the age of fifteen, he began a long history of training as an artisan with his first pastry apprenticeship as a chocolatier in his native Switzerland. During his long, impressive career, he's been executive pastry chef at some of the most eminent resorts and hotels in the world, including the famed Four Seasons in New York. There, in 1959, he created the now-legendary "Chocolate Velvet Cake." He was designated Head Pastry Chef at the White House during the Carter administration and later groomed an entire generation of pastry chefs and chocolatiers during his tenure as Pastry Chef Instructor at the Culinary Institute of America. Founded in 1946, the Culinary Institute of America holds the esteemed status of being one of the few residential colleges in the world devoted completely to education in the culinary arts. Many of the world's finest pastry chefs have experienced the tutelage of this Swiss-American master. Starting Green Mountain with his daughter Julie and son-in-law Jeff (a fellow graduate from the Culinary Institute of America, 1974), Albert has passed his professionalism and mastery on to not just family but also to staff, making Green Mountain Chocolates one of the premier chocolatiers in the world. Currently, the company is under new ownership but is committed to continuing the chocolate-making legacy of its founder. Green Mountain artisans are still an exceptional group of chocolatiers who are dedicated to carrying on Albert's remarkable devotion to excellence and craftsmanship. That means, of course, that only the finest all-natural ingredients will do. These principles continue to be Green Mountain Chocolate's recipe for creating exceptional tastes for chocolate lovers the world over. 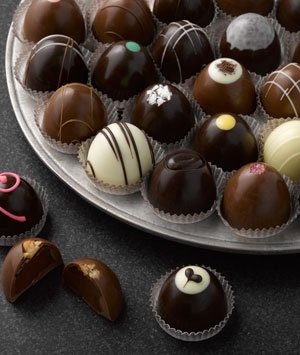 The first truffles were made from scraps left over from cutting dipped chocolates into uniform shapes. At the end of the day, the scraps would be combined, placed in a mixer, and beaten. The result was then piped out into small irregular balls, chilled, roughly coated with tempered chocolate and rolled in cocoa. They were called "truffles" because they resembled the famed truffles harvested by enterprising pigs in Périgord, France. Nowadays ganache is not a byproduct of chocolate making. It's prepared specifically for making truffles. It is allowed to set and is then whipped so it lightens. After that, the procedure is the same. The truffle centers are piped out and chilled, then coated with tempered chocolate and cocoa, confectioners' sugar, ground nuts, or praline powder. —Chocolate: From Simple Cookies to Extravagant Showstoppers. 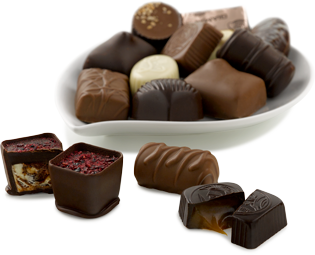 Like fine wines, chocolates should be stored in a cool, dry and dark area. Since chocolate is highly susceptible to absorbing odors, your chocolates should be kept away from other strongly fragrant foods. Optimally, you should store your chocolates at 59° to 65° F (15° to 18 °C), and under 65% humidity. If you keep them in an ambient temperature below 72°F (21°C), there is no need to refrigerate your chocolates if they can be eaten within three weeks. And, as we said, because of the care the company takes with packaging, Green Mountain Chocolates will last even longer. But let's face it, these chocolates will most likely be eaten within a matter of days! We would never judge you selfish, if you hide them somewhere so you get a chance to try all the flavors.